This web page was first mounted on July 6, 2010 by Sheila Schmutz. sheila.schmutz@usask.ca and updated on January 5, 2013. This is a private webpage that has no "official" connection to FTDNA or the Oliver or Oliphant Surname Y DNA Project there, or at any other such company. Please address corrections and additions to her. If you wish to correspond with other participants whose lines are shown, she will forward your message to them. The results of the Oliver men who have participated in Y DNA testing through this project are shown on the new website for the Oliver Y DNA project. The results of the Oliphant men who have participated in Y DNA testing through this project are shown on the Oliphant Y DNA project. Note that some Oliver men have also joined this project. This webpage focuses a few Oliver man who match several Oliphant men, who are believed to be descended from Duncan Oliphant who immigrated from Scotland to New York and then Hunterdon County, New Jersey. Although Duncan Oliphant's will lists four sons: David, John, Ephraim and James, it would appear that the descendants of Ephraim went south for the most part and not west to Pennsylvania. Descendants of John have not been found, to my knowledge. There are two Oliver men whose ancestors lived in the southern United States that also match this group closely. How they are connected is not yet clear. Solid line = Some evidence such as a Bible record, will, court record or census record. Note that the names of the participants and their Fathers are not shown to protect the privacy of the individuals. If individuals do not wish their line to be shown at all, please contact me and I will respect your wishes. The men whose lines are shown here match at at least 34 of 37 markers. 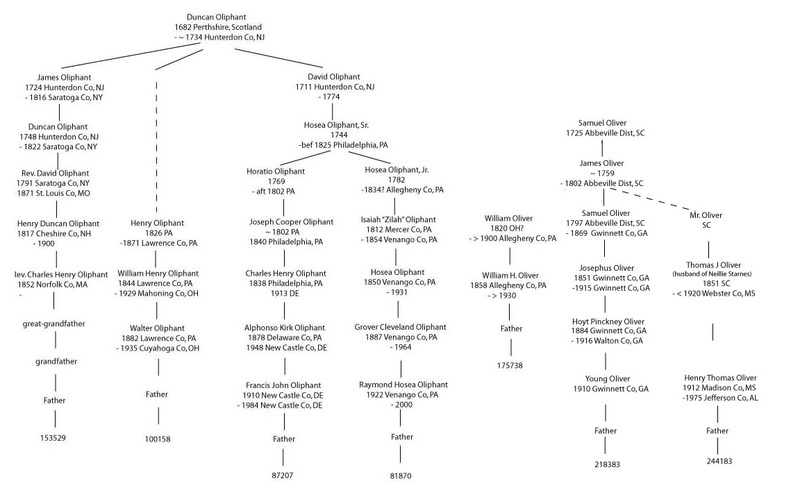 The genealogy of 87207 Oliphant and 81870 Oliphant links to a common ancestor Hosea Oliphant, Sr. There is one mutation in the line of 87207 Oliphant at marker 456 which must have occurred later in the line. The Y DNA haplotypes of the men who match "closely" and form this group are shown on a separate page. Thanks to the men who donated their DNA for this purpose. Thanks also to their family genealogists who have provided much of the information available on this webpage. These are often sisters, mothers, wives, and female cousins who can not donate Y DNA but provide support through their genealogical research. The genealogy data to support these lines is available on RootsWeb under the author name AlleghenyOlivers. The notes contain census data and various other information. I am very grateful to Greg Ross who has worked with me on finding the data in this file. Most of these Oliphant men's ancestors lived in Pennsylvania from about 1800 for a few generations. A map of Pennsylvania showing the counties today is presented here. Likewise the Oliver family lived in Pennsylvania, particularly in Allegheny County, PA. Hosea Oliphant, Jr. lived in Allegheny at about the same time period. The map at the right shows the regions of Scotland, with some cities. Duncan Oliphant is believed to have lived near Perth before coming to America. Additional papers collected by Samuel Grant Oliphant, held by the Historical Society of Pennsylvania. See http://www.clanoliphant.com/node/61 on how to search for these. Oliver Y DNA project at FTDNA This is the site to view the actual haplotype data and sign up to participate if you are not already tested and would like to be.